Call or EMAIL the Camp Registrar, Rebecca Seidl, to check on available dates (or to make a reservation) for your group. Available dates are not posted online due to frequent changes in availability. Weekend camps run September thru May. Camps begin on Friday and end on Sunday. Basic Info: Minimum age requirement is 7 years old (due to insurance reasons this is not flexible). Riding & Vaulting classes are exclusively for the children so the adults come at a discounted rate. See below for adult pricing. Peak Months: March, April, May, OctoberIf you come during a Peak Month you will receive 2 adults at ½ price plus for every 10 children, 1 additional adult will also be ½ price. Any additional adults pay full price.NON-Peak Months: January, February, September, November, DecemberIf you come during a Non Peak Month you will receive ALL adults at ½ price. $250 Non-Refundable Deposit and signed contract due within 30 days from when reservation is made. Reservations will not be considered confirmed until these are received. Final/Confirmed Head Count & Final Balance due 30 days prior to arrival date. Accommodates small youth groups as well as groups of up to 100 people total (max of 88 children). Program includes a 2 night stay at the ranch with 6 meals, classes in animal and horse science, vaulting (gymnastics on horseback), riding instruction, animal care time, plus evening activities, campfire and much more. Troops/groups will be bunked in their own cabin in either the Olde Schoolhouse or Fort Rawhide cabin areas. Final group size determines cabin assignment. Cabins are outfitted with wooden bunk beds/covered mattresses and overhead lighting. The modern shower/restroom facilities are located immediately adjacent to the housing areas. The group’s reservation must be made under the auspices of a sponsoring organization (i.e. Scouts, YMCA, etc.) who must provide the necessary Certificate of Liability insurance paperwork. Additional Info & Forms…Liability Release Forms are required for all children & adults attending (parent/guardian to sign for minors). Liability Release forms will be emailed to the leader 1 month prior to the arrival date to be forwarded to each person (parent) or to be printed and passed out. Signed release forms (1 per person) must be turned in to the ranch upon arrival. ActivitiesYouth Group Activities for the weekend program includes a myriad of classes and activities. Our core classes consist of 4 specific activities that are included in every camp program. WESTERN RIDING LESSONSRanchhands have a western riding lesson taught by the ranch’s certified riding instructors and their assistants. Geared toward beginners. VAULTINGLearning vaulting (gymnastics on horseback) techniques is an ideal way to help new riders understand posture, leg contact and balance from the beginning. For more experienced riders, vaulting techniques help them gain insight into timing of strides and rhythm as well. Vaulting exercises are the perfect way for riders to learn how to safely dismount “unexpectedly” and overcome a fear of falling. A safe way to learn since the horse is controlled by a longeur, vaulting focuses on the key elements in developing confident and competent riders. Vaulting is the gateway to all equestrian sport! ANIMAL SCIENCEOur Animal Science class gives our Ranchhands a chance to learn the basics of the various different ranch animals that we have here at the ranch. Our classes focus on the care, exploration, and hands on learning opportunities of a working ranch. HORSE SCIENCEWhat is the difference between a horse and a pony? Come find out in the midst of our famous pony barn for horse science classes. These classes focus on the many different aspects of horse and pony care, terminology, grooming and the psychology of herd animals and their behavior. Our Horse Science classes give every camper a chance to work with our ponies and horses to gain more confidence and respect for our large four legged friends. ANIMAL CAREEach Ranchhand will have an opportunity to participate in animal care time, morning and afternoon. This activity is based on old time chores that children living on a ranch would have had responsibility for. It may include raking out stalls and surrounding areas, and feeding/watering all types of ranch/farm animals. It’s all part of the ranch experience and builds great pride and teamwork within the group. Morning and afternoon animal care time is designed to help Ranchhands to learn about all aspects of taking care of animals and being responsible for them. After animal care time the Ranchhands will have the opportunity to wash up and then head off to their next activity. 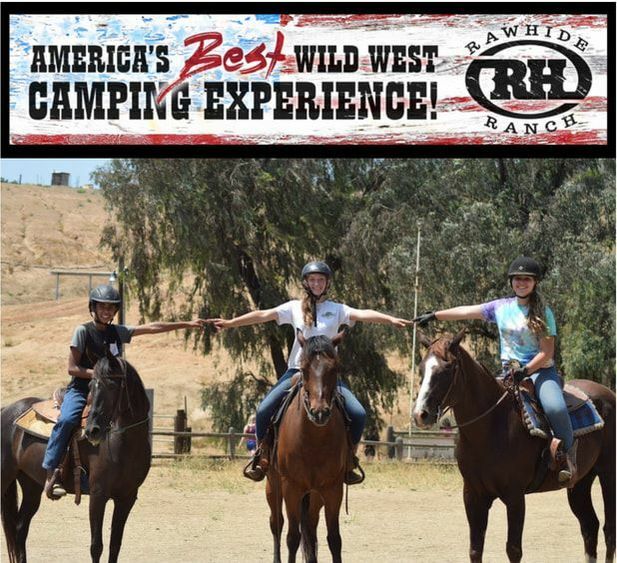 EVENING ACTIVITIESRawhide Ranch offers a wide variety of Evening Activities facilitated by our trained instructors. Based on the age of the students in camp our games and activities are carefully selected for their skills, abilities, and needs as a growing and learning group. The evening activities will include all groups in camp for the session. The first night of camp will consist of many different games and activities. This gives students an opportunity to have a lot of fun, work together in teams, and run off some great energy before lights out. Our second night of evening programming will also include more high energy activities as well as a traditional campfire lead by our wonderful year round instructors. We encourage songs, skits, and stories from your group but are certainly not required. Our staff will run the entire program for you engaging your students in fun and appropriate campfire activities. Both evenings will include down time and the flexibility to add any of your own additional programming for your group.